Ulundu sevai|urad dal idiyappam | paruppu sevai is a traditional sevai recipe made in our home using home made fresh sevai. 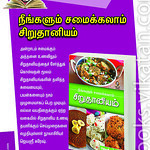 We used to help out amma and patti, in making the sevai using sevai nazhi. I tried ulundu sevai with Instant sevai. Amma always used to make sevai especially when w have guests. 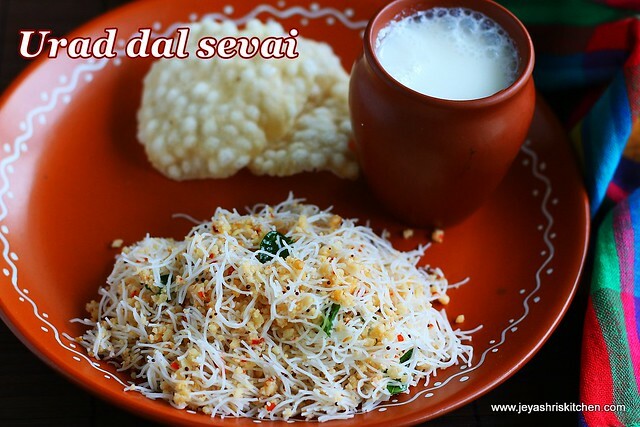 She makes different varieties of sevai and this ulundu sevai is the classic among all. But during my childhood days i am not a big fan of this as i prefer coconut sevai very much. Yesterday when i had guests for dinner i made this ulundu sevai. Though i made this with Instant sevai, the tasted closely matched with of amma's. 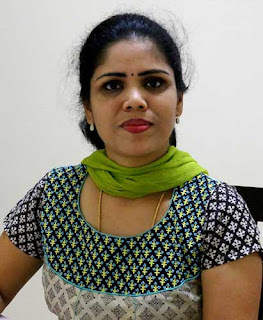 The urad dal mixture recipe is the same one we use for ulundu kozhukattai with video. 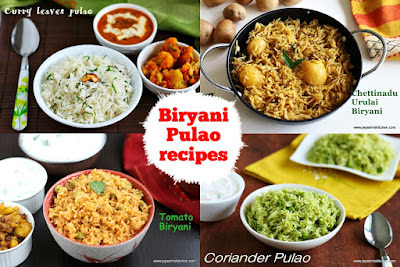 Let's learn how to make ulundu sevai with step by step pictures. *I used concord instant rice sevai. If using any other rice noodles add quantity as per the size. In a wide bowl add the Instant rice sevai. Add hot water to this and let this sit for a minute. Let all parts of the sevai soak inside the water. Take out from water and drain completely. Soak urad dal and red chili in water for an hour. 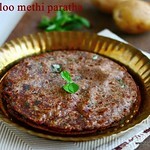 Grind this into a coarse paste by adding salt and asafoetida. Grease an idli plate and steam the urad dal mixture for 12-14 minutes, till it becomes firm. Insert a tooth pick and check whether it is completely cooked or not. If it is sticky steam for few more minutes. Cool completely. Keep it inside the refrigerator for 15 minutes. This step is optional. But by doing this you will get a nice texture of the urad dal mixture after we grind in the next step. Pulse this again in the mixie 2-3 times. Ensure the mixture is completely cool, else it will stick and spoil the texture. In a pan add cooking oil and coconut oil. Add in the mustard seeds and curry leaves. Once the mustard seeds splutter, add in the urad dal mixture. 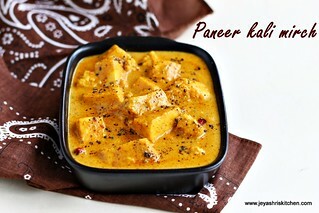 Add the cooked rice sevai to this. Switch off the flame. Transfer everything in a wide plate. Add the sesame oil. 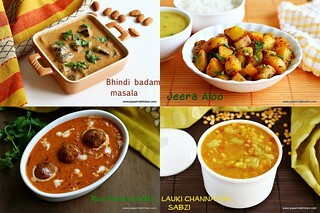 Using 2 spoons or clean dry hand mix the dal and sevai into an even mixture. 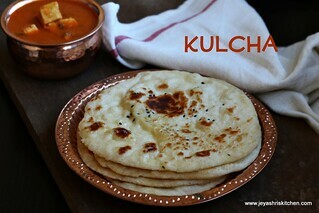 Serve with mor kuzhambu and appalam or vadam. 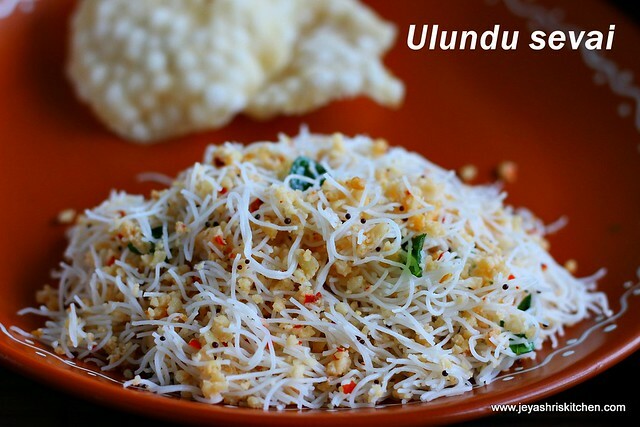 You can use millet sevai or brown rice sevai to make this ulundu sevai. Do not soak the noodles in hot water for a long time, it will be soggy. Always ensure that the urad dal is steamed perfectly. If it is soggy, it will spoil the sevai. 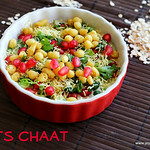 Cashew nuts or peanuts can be added while adding the mustard seeds. 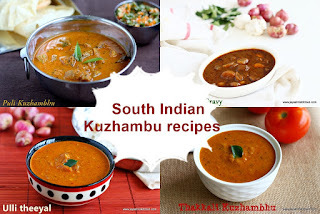 Ulundu sevai pairs well with morkuzhambu and appalam. Where did you get the instant sevai in sg ? We get in mustafa and even in fair price we get the Chilli brand.Many shops in Little India have this instant sevai.